As the Intervale Center’s Land Manager, Patrick works to improve continuity and communication between all the different parties at the Intervale. From cleaning up the hedgerows, to coordinating the construction of the pizza oven and the new pack house, Patrick’s work encompasses a wide range of initiatives. 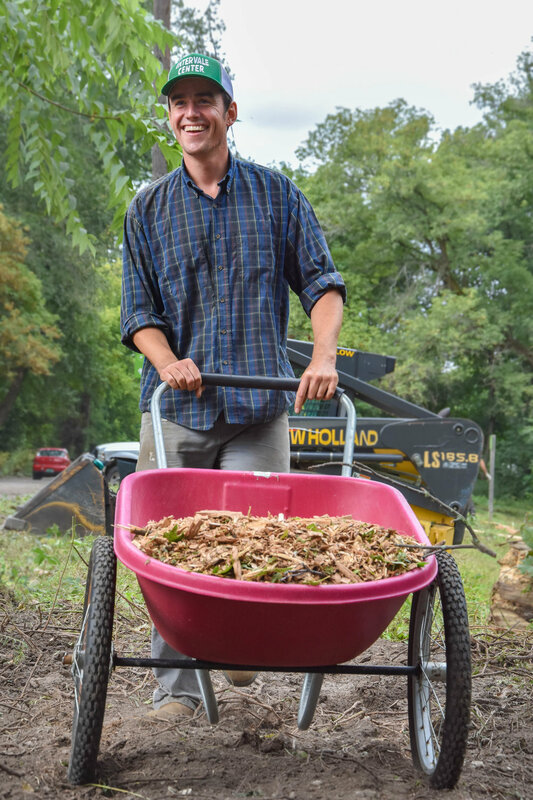 After earning a degree in Ecological Agriculture from UVM, Patrick farmed pasture-based poultry and livestock, and organic vegetables across Chittenden County. These experiences help him bring insight and passion to the stewardship of the Intervale Center's agricultural, historic and natural resources. I asked him some questions to find out more about what drew him to regenerative agriculture, and how he ended up here at the Intervale Center. It really started in college. I was interested in sciences and community development but neither of those programs really seemed right and then I took an introductory agriculture course and got really excited about it. So I switched my major to ecological agriculture. Also, I started school in 2007 and the financial crash was in 2008 so at the same time I’m trying to decide what to major in there was a lot of craziness going on and I was like man, if I just know how to grow food and take care of the earth, that’s really important: now and forever. That was the setting of me making this decision and it was definitely a factor, having a resilient path. How did your path take you to the Intervale? In college, I worked for Stray Cat between my junior and senior year. I tried to get any Intervale farm job that I could. After that, I worked at Tamarack Hollow and then eventually moved to Maple Wind Farm, which is really where I got interested in grass-fed and grazing animals. I was there for five years. After that, I was feeling like I was reaching a limit with how much growth I could have at Maple Wind, and it was a good time because there were some great people that could come up into my position. So, this past winter I was reflecting on farming and what I wanted to do. I was taking online computer programming courses and thinking “I dunno...maybe I’ll just really switch it up…” and then this job was opening up and I got really excited about it. How do those past experiences inform you in your job as land manager at the Intervale Center? This job is a lot more support and it’s a much more public-facing position. It’s a lot of engaging with everybody who’s down here, and a lot of design and planning work; things are always evolving. Whether it’s programs or construction projects or whatever, things are always changing; there’s way more going on than the farm. Shifting gears all day long, which is challenging for sure but it also keeps it interesting. Do you have any core, long-term projects that you’re working on? The biggest thing right now is enhancing the ag complex. Some of that space has kind of been neglected. It’s not anybody’s fault, it’s a little bit of the tragedy of the commons. There’s still remnants of the compost business and everything...so I want to get that space re-organized and making sure it has good flow, all that. I’m not at all critical of the farmers. It’s just that they don’t have the time to make that space organized because it doesn’t fall on one particular person, except for the land manager. That’s my job…filling in the spaces in-between. Because there’s been so many different farms, everyone’s left their mark and so I’m trying to recreate some kind of continuity and standardization so hopefully it’s better for everybody. I want to get the ag complex shined up and make everything just more consistent. Questions I’ve been asking myself are, What are the best parts of this model and how do we share that? What does the Intervale offer to farms to make them successful? What are the shared resources that make everybody more efficient and how do we build more of those into our shared spaces? What are our Intervale-wide shared strengths? Is there anything you feel is missing from the Intervale’s array of programs? I think understanding the cooperative nature of the Intervale and then trying to encapsulate that in some way so we can help that model spread in the broader Vermont area. Like if other spaces in Vermont became available, would we be able to reproduce what happened here in a really efficient way? It took thirty years to get from a garbage dump to here. If there was another piece of land in Vermont, could we reproduce this in ten years? I think streamlining, organizing, and understanding are all parts of that. And then, what else can I be doing to help the farmers be even better examples of sustainable ag. How can the efficiencies of having somebody in my position–taking care of those in-between spaces–create opportunities for the farms to do even bigger and better things? That could be allowing them to contribute to some kind of research, or they’re able to grow really special varieties that are difficult to grow, or just being extremely profitable. Would the farmer be able to do even more if I was better at my job? Those are the questions that I have.